Responsive – My phone is always on! If I cannot answer your call I will return it within the shortest timeframe possible. I do not have any scheduled days "off" and will take calls and handle business even while on "vacation". Trust me; I can't relax with my phone off. Knowledgeable – Before I started working in residential real estate in 2002, I worked for a real estate investment and development company. This experience gave me a breadth of knowledge that you will not find with other real estate agents. Because I understand the investment and development side of the business I am able to provide insight into the entire process from raw dirt to entire subdivisions. I will apply this knowledge to your transaction and advise you in making the most rewarding decisions. Experienced –I have spent many years in the residential real estate business. I promise that you will feel secure in my ability to handle any situation. Not all real estate transactions are simple but rest assured that I will be able to walk you through the entire process, negotiate on your behalf and create resolutions that will ensure your satisfaction. Tenacious –I will go after what you want! I will negotiate price, repairs, furnishings, upgrades, warranties, you name it. Successful negotiations are creative and strategic. I will strive to create a win-win situation but, honestly, what's most important to me is that my client walks away with more than expected. Dedicated – When you become my client, I will treat your transaction as if it were my own. I will show you as many houses as you want to look at, and answer any questions you may have. I will make you feel like you are my only client. I will go the extra mile so that you can find your dream home, buy an investment property with positive cash flow or sell your home for the highest dollar. If your looking to find your next home please click on the Search Properties tab to search listings in real time (updated frequently). Darrin Stumpf will provide you ll of the services needed in buying or selling your home! 1 of 10 Agents in the Country to Win the FIVE STAR: Best in Client Satisfaction Real Estate Agents award 15 consecutive years! We have worked with Darrin since 2006 on the purchase and sale of 5 properties varying from condos to waterfront property. Darrin has the depth of knowledge, experience and skill to represent us expertly as seller or buyer in the greater Seattle area. We recommend Darrin to our closest friends – he is the best. - Martha S. and Ron C.
Darrin is everything you could want in a real estate broker. He was a ball of energy, carefully orchestrating the strategy, staging and marketing of the property. He has the experience and people skills to negotiate the best deal for his client and handle the process through to closing. He was proactive and in touch at every step of the way. Darrin was the key to success for our sale. The transaction could not have been smoother and we were thrilled with the results. Whether it be setting aside his personal plans to visit new listings, digging through city records to investigate the smallest detail of an intriguing new property, or providing unbiased valuation and negotiating advice, Darrin consistently goes the extra mile. His real estate acumen is exceeded only by his integrity. In short, he’s fantastic. Experienced – I have spent many years in the residential real estate business. I promise that you will feel secure in my ability to handle any situation. Not all real estate transactions are simple but rest assured that I will be able to walk you through the entire process, negotiate on your behalf and create resolutions that will ensure your satisfaction. Tenacious – I will go after what you want! I will negotiate price, repairs, furnishings, upgrades, warranties, you name it. Successful negotiations are creative and strategic. I will strive to create a win-win situation but, honestly, what's most important to me is that my client walks away with more than expected. If you're looking to find your next home please click on the Search Properties tab to search listings in real time (updated frequently). Darrin Stumpf will provide you ll of the services needed in buying or selling your home! Bought a Condo home in 2017 for approximately $300K in Victory Heights, Seattle, WA. I'm a first time home buyer, and Darrin was amazing at guiding me through the whole home buying process. He's incredibly knowledgeable and experienced, which gave me great peace of mind because *I* certainly didn't know what I was doing! He's also very upfront and honest, which is crucial when it comes to such a significant transaction. He offered plenty of sound advice and was great about responding to my texts and emails. Because of Darrin, this inherently complicated process went off without a hitch and I closed on time! Very highly recommended. Bought a Single Family home in 2008 for approximately $350K in Haller Lake, Seattle, WA. Darrin helped my wife and I find and purchase our first home. Darrin was relentless in the pursuit of our needs. Darrin was very knowledgeable in understanding our present needs while forecasting our future needs. His experience steered us away from many potential headaches! The home we ended up buying was not even on our list, but one that Darrin suggested we go ahead and look at anyway. We have loved living there ever since (8 years)! As first-time home buyers, Darrin was great to work with, ensuring that we understood everything involved, from escrow to deeds, etc. Without a doubt, we will be using Darrin for any and all future real estate transactions! Bought a home in 2014 in Beacon Hill, Seattle, WA 98118. As a first time home buyer I was basically the equivelant of the guy who browses WebMD at 2am and then tries to convince his doctor he's got ebola. I spent hours and hours trolling Zillow looking over ads and baraging Darrin with requests and he handled everything like the pro that he is. We spent over a year losing bidding wars, dealing with failed short sales, abysmal inspections, Machiavellian sellers until finally landing the home of our dreams. The only reason I still have any hair and an ulcer free gut is because of Darrin's knowledge, patience and outstanding communication. Knowledge - everything from construction procedures of the 1970's, to the neighborhood's best secret restaurants, the guy knows everything and everyone! Seems like he'd worked with practically every agent we came in contact with which really helped smooth through some of the negotiating. Patience - I will admit right now, I sent an absolute barage of stupid questions at Darrin and he handled everything with grace and tolerance. Communication - The first two qualities listed above? Yeah I COMPLETELY lack those. I wanted to know everything and I wanted to know it yesterday. That's why this is the quality of Darrin's that I most respect and why I would recommend him to everyone. he took the time to explain (in small words for a newbie like me) what all my options were and what the next steps would be. He continually followed up and always answered promptly to my calls and emails. I demanded a lot from him and he over delivered in every possible way. As a result of his expertise we closed early and I'm now typing this from the comfort of my new home! I've already started passing his business card along. Strongly recommended! This letter is a testimonial to the skills of Darrin Stumpf. We met Darrin casually at one of his house showings in West Seattle, and were impressed by his skill and knowledge of the neighborhood and the property he was showing. By chance we saw him again a year later at another property he was showing and were impressed with his style and product knowledge. Fast forward about 5 years when we were in a situation in frantic need of a realtor and did not have a clue who to select from all the realtors at John L. Scott. His name and pictures jumped out at us and we knew immediately he was the one we needed. We called him late one weekend evening, and not only was he available, he immediately took charge of our situation and guided us through absoutely every step of the process. No detail was too small for him to attend to, and he overlooked nothing, and actually knew the seller. Experience counts. Our property was not a large transaction, but he treated it like it was a million dollar sale. And like we were million dollar customers! Kudos to a great craftsman and excellent salesman. Sold a Single Family home in 2012 for approximately $550K in Genesee, Seattle, WA. We have worked with Darrin since 2006 on the purchase and sale of 5 properties varying from condos to waterfront property. Darrin has the depth of knowledge, experience and skill to represent us expertly as seller or buyer in the greater Seattle area. We recommend Darrin to our closest friends - he is the best. Sold a Single Family home in 2009 in Genesee, Seattle, WA. Darrin Stumpf, very knowledgeable of what he does. He is excellent in negotiations skills, He help you any possible way of any question or concern you might have selling your property. We highly recommend Darrin Strumpf to sell any property we have. 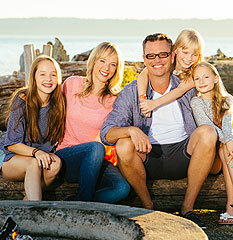 Darrin Stumpf is good family man. Bought a Single Family home in 2010 in Highlands, Kirkland, WA. Darrin is a professorial and knowledgeable agent. From multi-million dollar waterfront purchases to entry level condos. He knows the in's and outs of the entire process. I have used him for all my real estate needs and he has always been top notch. If you want someone who has your best interest and truly listens to what your saying and feeling then this is your guy!